how we can calculate the interest when the principal, interest rate and loan duration (in year & month) are given. Calculating Simple Interest (Part 1) from MathExpression.com on Vimeo. In this lesson, we will learn how to calculate simple interest, using some examples. Consider a loan of $5000 with the interest rate of 3%, for 2 years. Calculate the simple interest. Now, to calculate the interest, we can use the formula, I=Prt. Now, since the principal is given as $5000, we can substitute P with 5000. Similarly, since the interest rate is given as 3%, we can substitute r with 3%. Here, note that, we must change 3% into a decimal, before using it for calculation. To do so, we divide 3 with 100. This gives 0.03. Let’s continue, since the loan duration is 2 years, we can substitute t with 2. We can now calculate the interest. 0.03 multiply with 2 gives 0.06. 5000 multiply with 0.06, gives 300. Hence, the interest I, is $300. Alright, that is all for this example. Calculating Simple Interest (Part 2) from MathExpression.com on Vimeo. Consider a loan of $3000, with the interest rate of 5%, for the duration of 6 months. Calculate simple interest. Since the principal is given as $3000, we can substitute P with 3000. Similarly, since the interest is given as 5%, we can substitute r with 5%. Note that, we have to convert this 5% into a decimal. To do so, we divide 5 with 100. This gives 0.05. Next, the loan duration is given as 6 months. Hence, we can substitute t with 6 months. Note that, since the loan duration is always in 'year'. We must convert 6 months into year. To do so, since 1 year has 12 months, we divide 6 with 12. This gives 0.5 year. Now, we can start calculating the interest. 0.05 multiply with 0.5, gives 0.025. 3000 multiply with 0.025, gives 75. Therefore, the get the interest I = $75. That is all for this example. Calculating Simple Interest (Part 3) from MathExpression.com on Vimeo. Consider a loan with a principal of $2000, the loan duration is 4 years, and the interest after 4 years is $800. 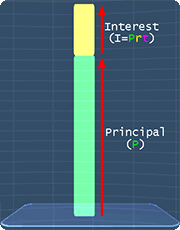 Find the loan's interest rate, r.
We start with the simple interest formula, I = Prt. Since the interest is given as $800, we can substitute I with 800. Similarly, since the principal is given as $2000, we can substitute P with 2000. Next, the loan duration is given as 4 years. Hence, we can substitute t, with 4. We can simplify by multiplying 2000, with 4. This gives 8000. Now we have, 8000r=800. Let's rewrite it here. To find r, we need to remove 8000. To do so, we divide both sides of the equation with 8000. This gives, r equals to, 800/8000. 800 divided by, 8000 gives, 0.1. Now, we have the interest rate as, r=0.1. Now, rather than leaving the answer like this, it is better to change 0.1 to percent. We can do so, by multiplying 0.1 with 100. This gives, 10%. Hence, the interest rate for this loan is 10%. You can start by going through the series of questions on calculate simple interest or pick your choice of question below.